Fisher Price Little People have evolved extensively from the spindle-like figures that gained popularity in the 1960s, but their fun factor has not changed. Today, the chunky Little People are perfect for young children and provide hours of imaginative play. With all of the structures, figurines and other accessories available, it is easy to find Little People to meet any child's interests. The Little People Zoo Talkers collection helps your child build his very own zoo with a variety of different sets. The Animal Sounds Zoo Train will help children enjoy one of their favorite zoo attractions at home. Animals can be stored in the train or take a ride on the attached Ferris wheel while listening to cute music. Included with the train are a conductor named Michael, and two animals. Your junior zoo keeper can also cart animals around with the Animal Sounds Safari Truck. The truck comes with Eddie the truck driver, a giraffe and a lion. It also plays safari music. Bring the farm indoors with the Little People Animal Sounds Farm. Farmer Jed and a cow, sheep, horse, goat and pig come with this traditional red and white barn and silo. As kids open and close the doors or slide the chicken along the top, the farm makes fun animal sounds. When it comes time to feed the animals or plow the fields, pick up the Tow 'n Pull Tractor. The tractor comes with a Little People Farmer and a cow. It also plays a cute farm tune when the seat is pressed and has a pig hidden in the haystack. For a smaller option, try the Play 'n Go Farm. It has the look of the original Little People farm from the 1960s and the farmer, small tractor, fences and two animals store neatly inside. A handle makes the farm easy to take on the go. A mom, dad and baby are included with house, along with a basic set of furniture. Best of all, when playtime is over, everything stores neatly inside. Little People Wheelies are race cars and tracks for younger kids. Included in the Wheelies collection are multiple race tracks that can be used with the large variety of Wheelies race cars. Cars are sold individually and in multi-vehicle packs. Your toddler will love the Stand 'n Play rampway, which is the perfect height for young racers. It comes in traditional primary colors or in a pink version so even girly girls can race cars too. Two main tracks are included on the rampway which wind cars around the base. It also makes fun sounds as the cars reach the bottom and contains multiple ramps for moving cars up and down the track. All of the Wheelies cars can double as roller coaster cars with the Loops 'n Swoops Amusement Park. Two tracks are included on this colorful, two-foot tall structure, including one with a 360 degree loop. Kids 18 months and older will also enjoy moving the flags around the amusement park and playing with other attractions, such as a fun mirror and ticket booth. The Little People Disney Princesses collection is one of the latest additions to the Little People line. 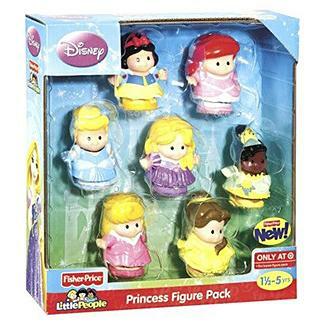 Disney's princesses and their princes are transformed into the chunky figurines perfect for the littlest princess fans. A special Snow White set also features the seven dwarves. Snow White and Cinderella are included with the palace. Your toddler's favorite superheroes are also Little People figurines. Batman, Robin, the Joker, Superman, Wonder Woman and the Green Lantern are all part of the DC Super Friends collection. In addition the figurines, the characters are also available in Little People Wheelies to be used with the Stand 'n Play rampway and Loop 'n Swoops Amusement Park. The DC Super Friends Batcave is the perfect hideout for all of the superheroes. It comes with a Batmobile and helicopter, plus a garage for storing the vehicles and a ramp for easy escape. Fisher Price Little People were originally not called "little people." The toy started as a "Looky Fire Truck" in 1950, although the overall style of this toy can date back even farther to wooden toy trucks with little wooden people sculpted inside. 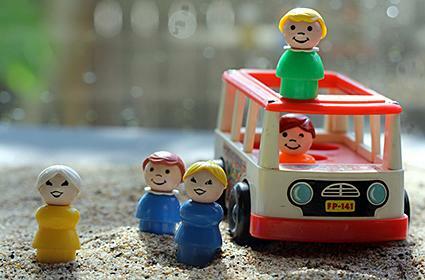 In 1960, Fisher Price released a station wagon toy that came with a play family. That family included a mom, dad and child. The popularity of these little people (a name later adopted by Fisher Price because this is what customers were calling the play people) increased and the company soon released boats, farms, a hospital, parking garage, house, accessory sets and even a Sesame Street-themed town play set. Because Little People remind many people of happy childhood memories, a large number of adults have begun collecting these toys. Some collectors have been known to pay $10 or more for a tiny accessory, such as a small yellow life preserver. The rarity of the item, as with most collectibles, determines how much it is worth. There are several sites that can help you locate and price collectibles and connect with other fans of this toy. This Old Toy gives a complete run down of Little People history. You'll also find a list of the difference in body types from year to year and what to look for in an ideal collector's piece. Fisher Price Collector's Club offers club news, announcements and a community of other collectors to help you on your Little People journey. Little People play does not have to end with the play sets you purchase. The Little People website offers an online clubhouse featuring games and activities. Learn all about the Little People friends or listen to Little People Radio. The games and activities on the website are appropriate for toddlers and preschoolers who will love seeing their favorite figures on the computer screen. You can also bring more Little People into your home with the books for toddlers and kid-friendly music.